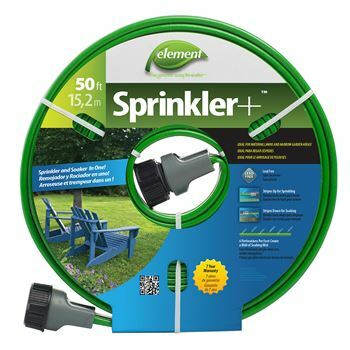 The Element 50 ft. Sprinkler Hose is perfect for narrow, small space watering. Its lead-free construction makes it ideal for all types of gardening including vegetable gardens. With 6 holes per foot, this Element hose provides a consistent and uniform watering pattern. Great for experienced landscapers, farmers and gardeners, this 250’ bulk soaker hose reel can be cut down to create the perfect watering layout for any yard or worksite. This 100' soaker kit features 18 EZ-Connect System connectors, so you can set up straight rows for fruits and vegetables, curve the hose around landscaped bushes or form a ring around trees and bushes to ensure that they get the amount of water they need to grow. Tackle all of your flower bed, lawn and garden projects with the right amount of water that drips through the pores of this 50-ft. soaker hose. Assembly could not be any easier: simply cut the hose, push on the EZ-connect system connectors and you’re ready to set up you garden soaker hose system! Including two EZ-Connect fittings, this 75-foot soaker hose is one of the most customizable models on the market. Perfect for reaching far distances and maintaining delicate landscaped areas, this hose will efficiently deliver water to the roots of your plants through the toughest and driest soils. Our soaker hoses will suit the needs of any sized irrigation project. We offer easy-to-set-up Miracle-Gro 50' to 100' complete soaker hose systems with connectors, Element 25' to 75' hoses with fittings and 250' bulk soaker hose reels. Whether you lay your hose on the ground or cover it with soil or mulch, it delivers moisture straight to the roots, which eliminates evaporation from the surface of the ground and helps to save about 70 percent of the water as compared to open-air sprinklers. Don't worry about the PSI from your water supply anymore. Our garden soaker hoses don't require a pressure regulator when used with our patented water restrictor. The soaker hose systems come with connector kits that will help you fully customize your irrigation setup and use the system for any gardening purposes. The hoses are environmentally friendly and are made with 65 percent recycled rubber. Seven-year warranty protection will ensure that your system will run smoothly season after season.